Another bowl a ramen slurped means another contender to be added to my list for the Best Ramen in Denver. 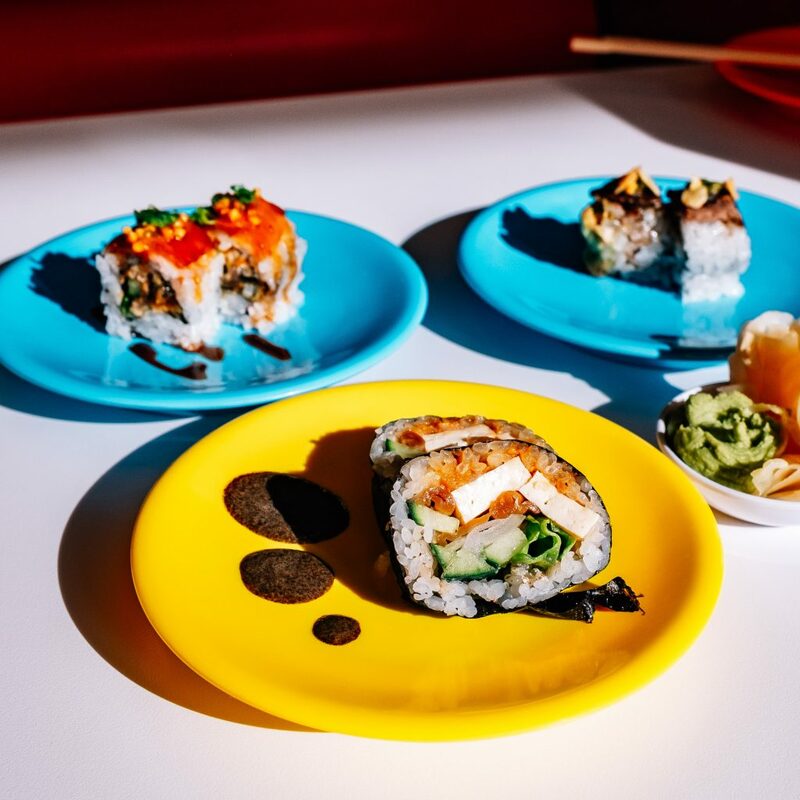 I recently headed to chef Jeff Osaka’s joint, Sushi-rama, after hearing they were adding a few of the same ramens offered at his other restaurant, Osaka Ramen, to the menu at the DTC and Lone Tree locations. Please note: Financial compensation was not received for this post. I was invited by Sushi-rama to come in for a meal on the house. Opinions expressed here are my own. Sushi-rama is known for its moderately priced sushi, which snakes through the restaurant courtesy of a conveyor belt. Each serving (usually 2-3 pieces) is served on brightly colored plates that correlate to a price tier. 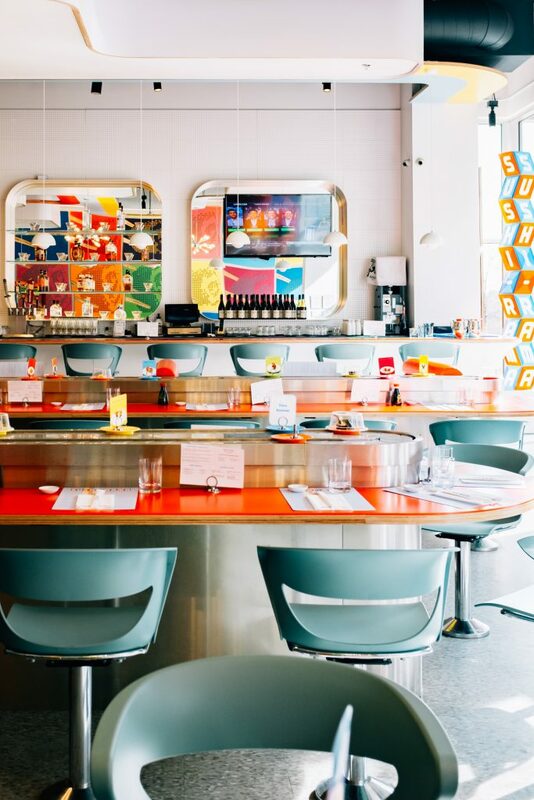 The fun factor continues with a sixties-inspired decor full of pop-art style images and countertops, booth coverings, and chairs in saturated colors. Couples can slide into one of the two-person booths and larger groups are best served by securing a few chairs in the same row, or along the end of the row where the seating area is curved, which will allow you to easily chat with your fellow diners. 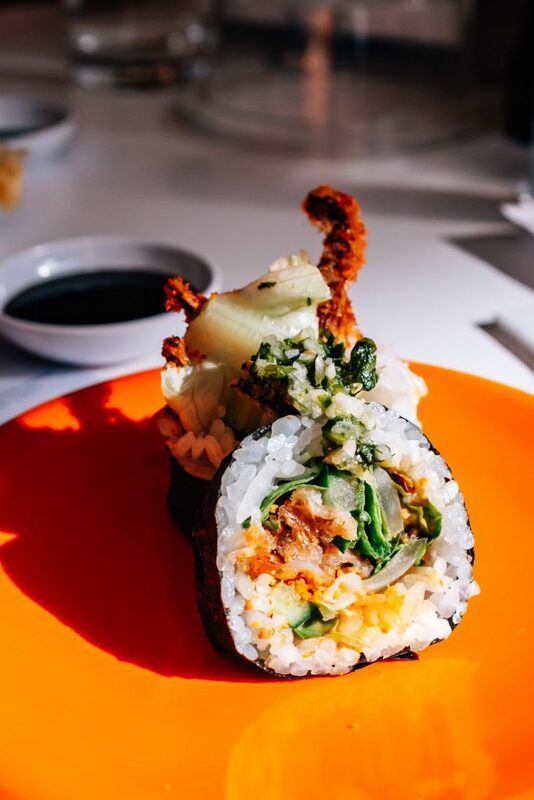 I also tried the Surf & Turf (lobster tempura with seared NY Strip – another fave), The Kraken (fried squid legs with bibb lettuce, and the Umami Roll (tofu, cucumber, pickled onion – a good option for vegetarians). 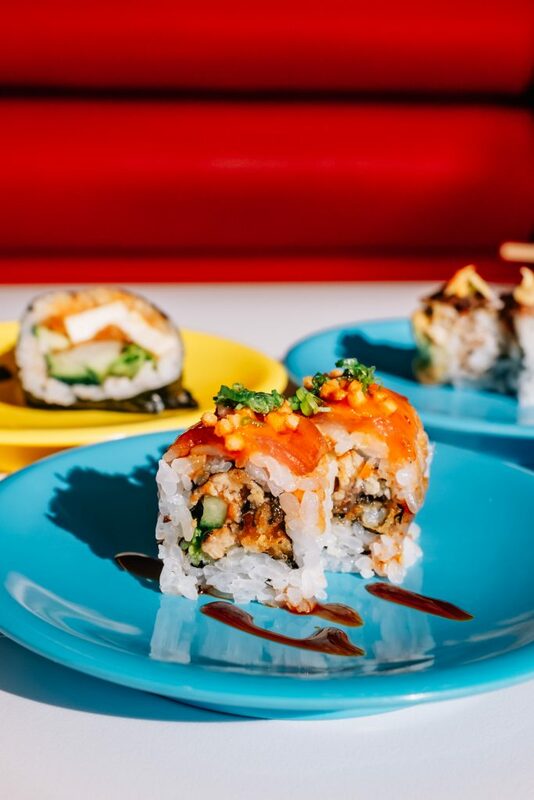 The Umami roll is made with tofu. While my husband continued to dine on sushi, I held back in order to save room for the ramen. 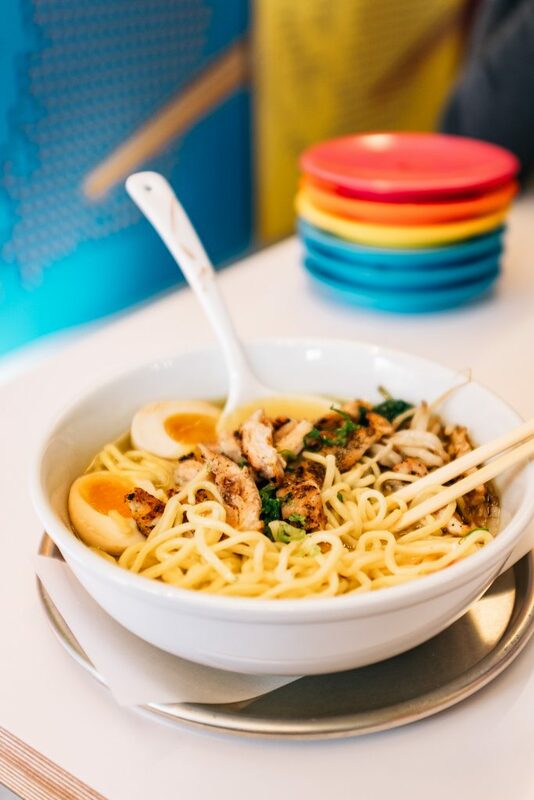 There are two ramens offered at the DTC and Lone Tree Sushi-rama locations – the Spicy Miso and Shio Ramen (each $13). On the advice of the restaurant manager I got the Shio Ramen, which turned out to be a great suggestion. I really liked this bowl! I tend to favor lighter style broths and chicken is my preferred ramen protein, so this was right up my alley. 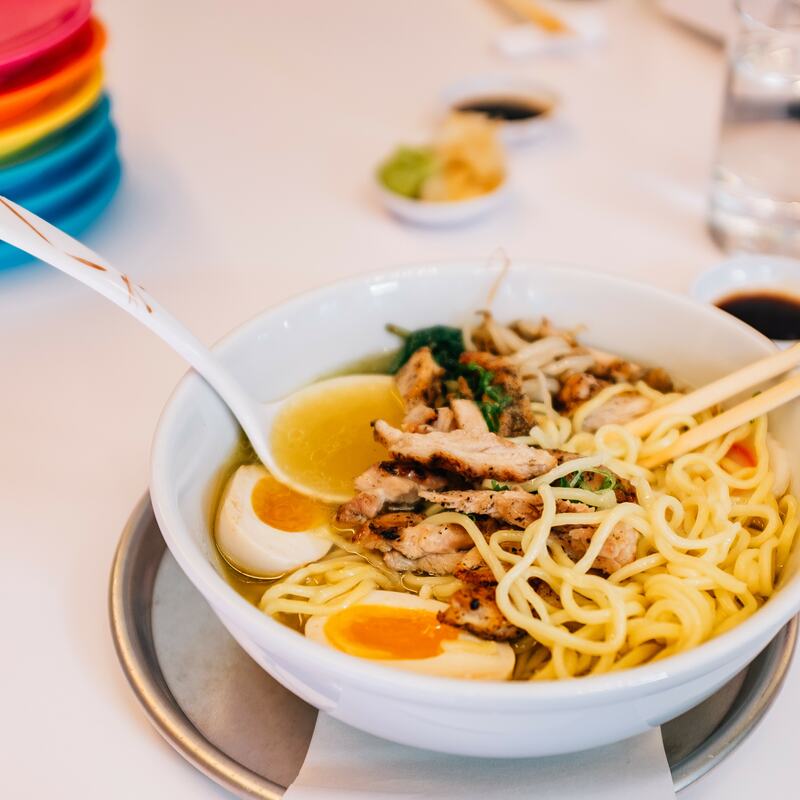 The Shio Ramen – like a Japanese chicken noodle soup. I wasn’t able to finish the bowl at the restaurant, so I took some home and the ramen held up as a leftover as well! Sushi-rama is a fun place to come eat. It’s great for families, couples, and groups of co-workers. There is a certain amount of joy that comes with seeing the little plates of sushi wiz by you and the instant gratification of being able to see a roll you like, grab it off the conveyor belt, and eating it straight away. The individual servings are reasonably priced, $2-4 a pop. This means you can get a decent meal for relatively little money if your are judicious about which plates you take off the belt. They do run a happy hour, Monday – Friday, 3-6pm at all locations it’s 25% off all plates off the belt and 25% off select beer, wine, sake and cocktails, so it pays to come early!